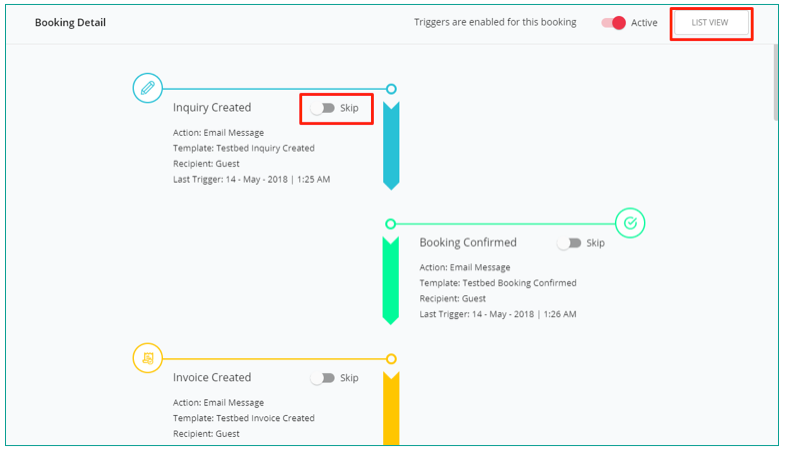 Automata allows you to skip or disable triggers for a specific booking, in order to further customize messaging for individual guests. You can create, view, and edit each individual trigger in a booking in order to customize your messaging for each guest. It's easy to view and modify the triggers for each booking. Here, you can use filters to sort and search through your bookings, as well as edit or skip triggers. Click on a booking in the table to open the booking detail overlay. You can use the master switch in upper right hand corner to disable ALL triggers for this booking. Click on any trigger to edit the trigger or the template. NOTE: If you edit a trigger from this overlay, the changes will take effect in all bookings that the trigger is scheduled for. You can edit the columns in the table by clicking the custom column (three lines) button in the column header. You can adjust how many bookings are shown per page by changing the page settings at the foot of the table.